The beer is cold, the food is tasty and our staff always looks forward to seeing and serving you at YOUR American Legion Club 39. Check out our new 40" TV's behind the bar! Everyone should have a good view now of the games! The Annual Craft and Antique Market with Bake Sale will be this coming Saturday, March 9, 2017, at the Legion in North St. Paul from 10 am until 4 pm. Those of you who are interested in baking, please bring your baked items to the Legion any time after 9:00 am on Saturday. Your baked items are appreciated. 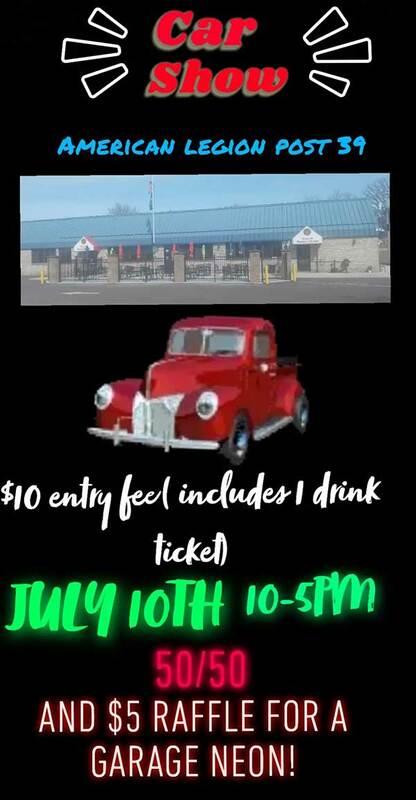 As part of the Legion Post 39 100 Year Anniversary we will be having our First Annual American Legion Car Show on May 19, 2019, from Noon until 5:00 pm. The entry fee is $20 at the Gate. There will be cash awards for 1st, 2nd and 3rd Place. There will be food and beverages provided at minimal cost.